Aye, Bloodbaz changes from hoster (last year) to entrant this year for the CSSCGC. And he likes doing it big, and I mean BIG. Behold, ’cause this game is the direct sequel to the community favourite SQIJ. And, of course, it has to surpass the original game in any way possible. For example, this time the bird is EVEN BIGGER, cats are EVEN NASTIER, and bird food is EVEN TASTIER. One could say that Byrd is, in fact, SQIJER, if you tolerate the pun. Yes, boys and girls, this game has probably the biggest number of UDG ever featured in a pure BASIC game: around 779 in all. Yes, you have read correctly. 779 unique UDG. Just peek at the screenshot. 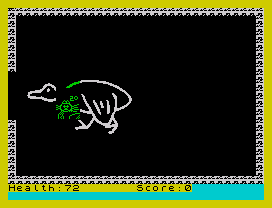 But the sad thing is, to move such a massive bird in pure BASIC is quite hard to achieve. If you are fine with a 0.5 frames per second rate, then this game is for you. And it comes complete with a big deal of garbage on screen, depending on which direction you move. Use O, P, Q, A and explore the shitload of screens available. This one got me inspired, I might do something simmilar. Something even SQIJER. Try this: fill your mouth with rollos and shout SQIJ as louder as you can. Laughs granted. I’ve been arsed to do something about this game, this is, a Hi-Soft Basic compiled (faster) version: http://www.mojontwins.com/csscgc2011/entries/byrdcomp.tap – Hope you don’t mind, Bloodbaz. I do take issue with 0.5fps though. I reckon it is much near 1.0fps!